How Many Calories Are in Ranch Salad Dressing? What Vitamins Does Mayonnaise Have? It has a fancy name, but aioli is nothing more than garlicky mayonnaise. And like all mayo, this dressing is packed with fat and calories, thanks to the traditional base of oil and egg yolks. If you're making aioli at home, however, it's simple to lighten it up: Just use light or fat-free mayonnaise instead of the regular variety, and don't add any oil. Calorie count varies, but one recipe for aioli from "The New York Times" contains 85 calories in just 1 tablespoon. An aioli recipe from "Epicurious" has a larger serving size of one-third of a cup, and it contains a whopping 464 calories per serving. 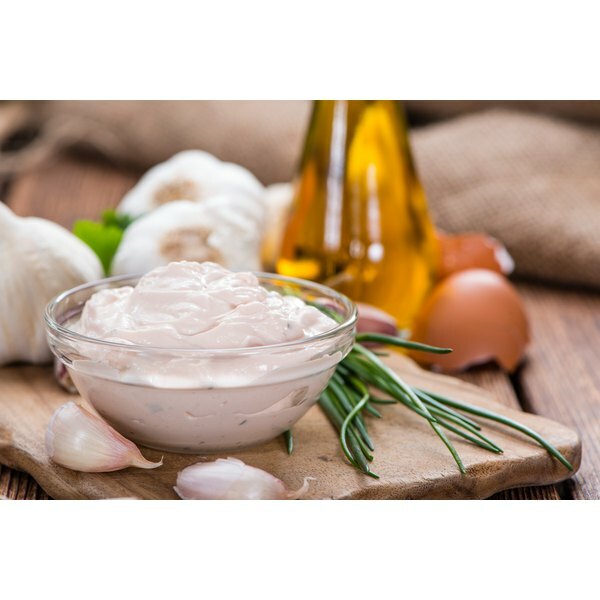 If you make a leaner aioli by mixing bottled light mayonnaise with garlic, you can reduce the damage to just 36 calories per tablespoon.